While the Vancouver Canucks are fighting to keep their diminishing playoff dreams alive, the Anaheim Ducks are fighting for first place in the Pacific Division. With a win tonight, the Ducks can match a franchise record for victories. With a win tonight, the Canucks’ chances of making the playoffs will still be at around 3%. Without a doubt, the Ducks will not be an easy team to beat. Heck, the Canucks have yet to beat them this season. Remember that brutal 9-1 loss in Anaheim in January? Remember the Ducks’ 7-minute, 5-on-3 power play in the third period while already leading by 6 goals? The Ducks have outscored the Canucks 16-5 in their first 3 games this season. Rookie goaltender, Eddie Lack, has started 14 games in a row. 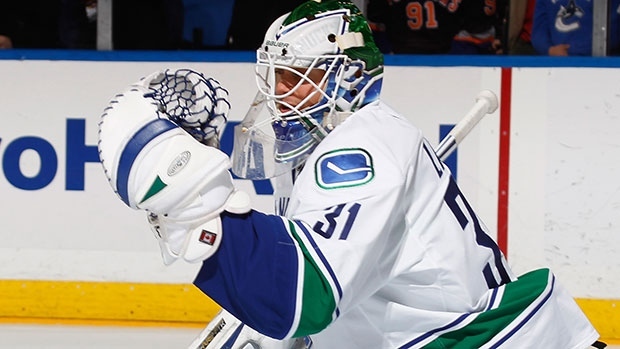 Sure, he’s had his ups and downs, but for the most part, he’s given the Canucks some solid goaltending. He’s 3-0-1 with one shutout (against the Nashville Predators) and a 0.929 save percentage in his last 4 games. If you want a reason for the Canucks’ lack of success against the Ducks this season, consider that Tom Sestito is the only Canuck to score two goals against them this season. (Zack Kassian, Ryan Kesler and Kevin Bieksa have the other goals.) However, in their last matchup, Sestito finished with a game-high 22 penalty minutes. Incidentally, Sestito leads the NHL with 201 penalty minutes. Less fighting, more goals, please? The Canucks today recalled Frankie Corrado from the Utica Comets in case Kevin Bieksa, who suffered some sort of injury last game, can’t play. For what it’s worth, Bieksa’s on the ice for the morning skate. Sha-na-na goodbye Canucks. 40 + years and nothing to show. While I can’t dispute your 40+ years without the Stanley Cup, judging by your “handle” you’ve decided now to cut ties with the team? Who you cheering for now?